Mayonnaise is getting a bad reputation due to the questionable fats the big brands use in their products. At the same time, it is impossible to imagine our lives without quick and yummy egg or potato salads and many other dishes that simply could not be prepared without mayonnaise. 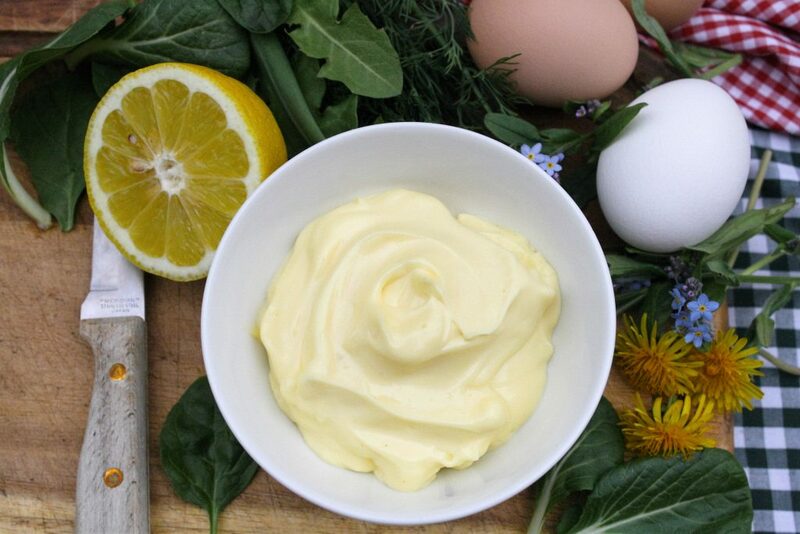 The homemade mayonnaise, however, is nothing less than a bowl of goodness, if to use high quality fresh oils and pastured eggs in it. It can very easily be prepared in literally just a few minutes. Any spices may be added to your taste: a dash of black or cayenne pepper, any dried herbs, horseradish, extra Dijon mustard, or a clove of garlic. I prefer to keep it basic though. Usually, I make bigger batches that would last for a week or so and add all the extra flavours directly to dishes. 1. Place all ingredients in a high glass jar (0,5 L jar would do) and let them settle as they wish. 2. Place an immersion blender close to the bottom of the jar, and start blending. Be patient and do not move the blender for about half a minute until you see the mixture gradually becoming white and creamy. 3. Pull the blender up slowly, incorporating the remaining on top oil, until all the mass is evenly white and opaque. Agitate for a few more seconds to fix the result. Your Homemade Mayonnaise is ready! And, please, never use the grocery store bought hydrogenated chemical again, never let your family or your friends eat it, unless you absolutely hate them.